Figs are one of the most luxurious fruits with their velvety skin and sweet, fragrant centre. Halve and grill them until golden, and serve with a scoop of vanilla ice cream, or uncooked with a spoonful of mascarpone cheese. Marsala is a fortified wine, which originally comes from Italy. Its sweet, robust flavour makes it ideal for desserts. There are more recipe ideas for figs in Autumn Seasons. Heat the butter in a large frying pan and fry the figs, cut side down, for 2 minutes, until they start to colour. Stir in the sugar and cook for 2 minutes. Move the figs to one side and lay the slices of Madeira cake in the frying pan. Fry for 1-2 minutes each side, until golden. Place the cake on four serving plates and keep warm. Add the Marsala to the pan and bubble for 3-4 minutes. Divide the figs between the plates and pour over the sauce. Serve with scoops of vanilla ice cream. 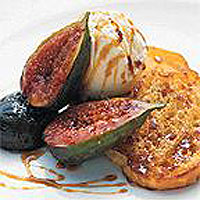 Figs work well in sweet and savoury dishes. A simple dish of figs wrapped in slices of Parma ham makes a great starter. When choosing figs, select those that are soft but not over-ripe.